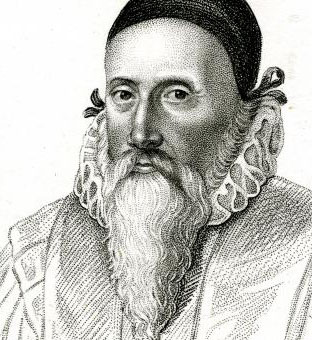 Dr. John Dee brought drama, anxiety, knowledge and thrills to the Tudor court. He was a seeming authority on the planets, geometry, the navigation of major land masses, cryptology, language and alchemy. He advised the royals with his horoscopes and he proffered Queen Elizabeth a channel into the otherworld. He was across science and magic before the terms were divorced. He massed up a huge library at his home in Mortlake, much of it esoteric. He is a likely model for Prospero in Shakespeare’s The Tempest and was later mocked by Ben Johnson in The Alchemist when his reputation was in decline. But John Dee is remembered and rediscovered by artists such as Jeremy Dellar and Damon Albarn, in the work of Neil Gaiman and Peter Akroyd. He was regarded by the Rosicrucians and Aleister Crowley as a keeper of the Hermetic flame and interestingly, Ian Fleming may have adopted 007 from a cipher that was used for communications between Dee and the Queen. The John Dee exhibition at the Royal College of Physicians is presented in a sensible manner. Still it amazes. Many of the books on display were stolen from his Mortlake house after Dee left England for an intense European journey in 1583. Sometimes his name has been scrubbed out or overwritten in the recovered volumes, but there are footnotes and doodles in the actual Doctor’s hand and bursts of Latin excitement – NOTA BENE! – whenever Cicero, alchemy or bold mathematics are revving his gears. The exhibition features an obsidian mirror with a sharkskin case that he apparently used for his divinations, allowing the Queen to see likewise into this shew-stone. There’s a crystal orb that he claimed was a gift from the angel Uriel plus a gold, inscribed disc and other arcane accoutrements. Critics of the man will talk about his relationship with Edward Kelly, who had presented himself as a “scryer” in contact with the spirit world. 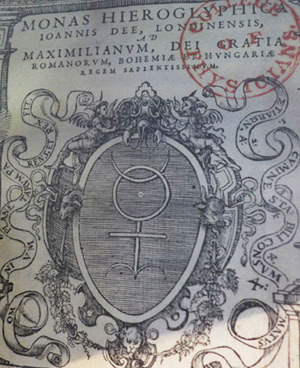 This partnership resulted in volumes of conversations in an Enochian code, meanderings in Eastern Europe and matrimonial cross-matching in 1587. This was also a fervent era of spies and intelligenciers and it is possible that Dee was an agent. Better again, there are dazzling theories that William Shakespeare was one of Dee’s colleagues in espionage in the 1580s. He was perhaps travelling as Francis Garland or William Hall, taking messages back to Elizabeth’s court from Trebona and building up a knowledge of Hermetic practice that would later show up in his poetry and his plays, ultimately set down in The Tempest. Prospero returned in the ‘Blackstar’ video as Bowie rocked on his heels and brandished his dusty grimoire, a magus preparing to drown his book and to leave the island. The singer had indulged in an alchemical working in the video for ‘The Heart’s Filthy Lesson’ and his output had been spattered with Hermetic codes and a yearning for a golden transubstantiation. Surely then, Bowie was a fan of John Dee? The walls and the bookcases in Derek’s room had featured John Dee literature plus drawings by the man. This had alarmed Bowie in some way. Still, the director had previously pictured John Dee in the opening section of Jubilee, his 1977 punk film. As the fiction begins, the Doctor is at home in Mortlake with Queen Elizabeth and they summon the angel Ariel. They are dutifully shown a vision of the future, “the shadow of this time”. This involves Adam Ant, Toyah, Jordan, Wayne County, Lindsay Kemp and a recently murdered Queen. Buckingham Palace has become a punk den. There is noise, ritual and severe disturbance. On some level, John Dee was the cause of it all. A wiz, a true star. Scholar, Courtier, Magician: The Lost Library of John Dee, Royal College of Physicians of London, until 28 July, 2016.